I love fish pie; to me it’s the ultimate in comfort food. Creamy mashed potatoes and delicate flaking fish scented with fresh dill and just a hint of lemon, all baked until golden, crunchy and molten hot. My tongue has had its fair share of fish pie induced burns, I can never wait until it’s cooled down before I dive in. While the recipe i’m about to share is by no means the classic version, and I do promise to upload that one day as it’s the fish pie that will make someone fall in love with you, but It’s a brilliant version none the less. This is my lighter and leaner pie. 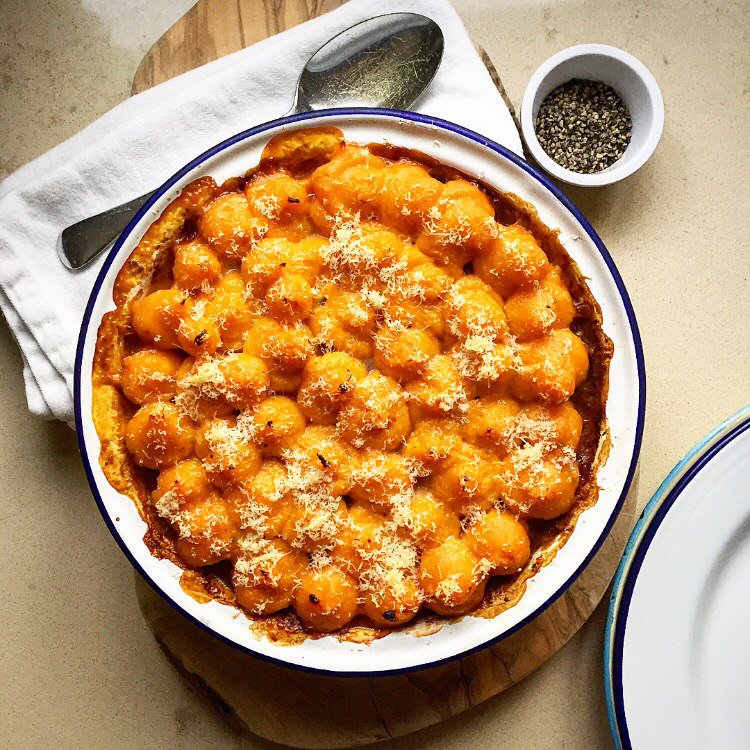 It’s topped with sweet potato mash instead of regular spuds, as they count towards your 5-a-day and are filled with the mood-boosting vitamin B6. All of the B group vitamins affect how our brains function, deficiencies have been shown to have a negative effect on mental health issues. Severe deficiencies have been linked to serious mental health illnesses such as acute depression, which illustrates how important a role they play in the body. We need the B6 found in sweet potatoes to help our brains to produce serotonin and keep us happy! I’ve also crammed as many extra veg into this recipe as I can, without compromising the flavour. Vegetables are full of vitamins, minerals and fibre which can deplete when suffering with anxiety, so we need to keep them topped up. I’ve used salmon as well as white fish and prawns so it’s high in protein, B12 and Omega 3. Omega 3 is an essential fatty acid that promotes cardiovascular health as it helps to raise our good cholesterol while lowering the bad. Recent studies have shown that it also has very positive effects on mood disorders such as anxiety and depression. In fact a study published in the Journal of Clinical Psychology, June 2010, reported findings that omega 3 supplements were found to be as efficient as conventional antidepressants in the treatment of major depression. So now we’ve established how awesome this fish pie is you’d be a fool not to make it, just remember to use the #BakingYouBetter. Enjoy some mindful cooking and healthy, tasty eating too. Heat oven to 200C/180C fan/gas 6. Prick the sweet potatoes with a fork and put on a tray lined with parchment, roast for about 1 hour 30 minutes (depending on size, mine were roughly 250g each) turning half way. Until they feel tender when pressed in the middle. Meanwhile heat the oil and a pinch of salt in a deep frying pan and sweat the leek, onion or shallot and celery on a low heat until really soft, about 15 minutes. Keep adding a splash of stock every so often if you need to, to stop the veg sticking. Add the flour and stir well cooking for 45 seconds, then add half the garlic, mushrooms and wine or vermouth and bubble until evaporated. Tip in the stock and simmer for 5 minutes until thickened then take off the heat and stir in the crème fraiche or sour cream and the chopped herbs. Halve the potatoes and scoop all the flesh into a bowl, the skin should peel away easily. Add the nutmeg, remaining garlic puree or crushed garlic, some salt, pepper and the soft cheese. Blitz with a stick blender until smooth. If you don’t have one you could mash it but it wont be as smooth. Tip the fish and prawns into the sauce and stir to combine, season with salt and black pepper. Transfer to a medium ovenproof dish or two smaller ones if you’re making two pies. Either pipe the sweet potato on top or spoon it on then spread out with a knife. Top with the grated Parmesan. You can chill the pie now for 1-2 days or freeze for up to a month. If eating straight away keep the oven on after baking the potatoes and cook for 30 minutes, until golden and bubbling. Serve with green veg.